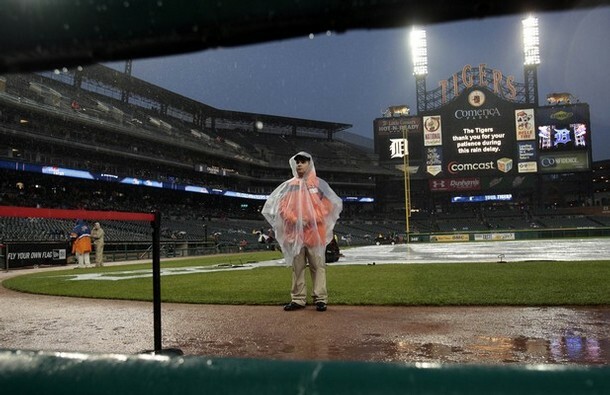 The rainy weather skipped and missed a lot of baseball games during April. Unfortunately, Mother Nature seems like she is playing catch-up during May. For the second time in less than a week the Tigers have had a postponement of a game due to the rain. Tonight’s game was one I am sure they would have liked to get in, mainly because the Tigers wouldn’t have seen the Blue Jays again this season, and finding mutual and convenient days to make up a game can be difficult. Not to mention that days are not only well-deserved – they are essential. Teams don’t want to use them playing make-up games. The Tigers have rescheduled this game for June 27, 2011. Rick Porcello who originally was going to pitch tonight, will miss his turn. Phil Coke will get the start against Boston tomorrow. There will be two games at Fenway before the Tigers head westward to Pittsburgh to face the Pirates in Interleague play this weekend. as we would like them to do just that. to kick the 2011 campaign off with a win, it wasn’t crucial. hounds him is a psychological one. Teixeira in the 3rd inning. He walked 4 batters and struck out 8.
have a quality start. That is a pretty good way to begin the season. Miguel Cabrera had a single in the 2nd and scored 2 runs – one of them in 4th after drawing a walk to start the inning. reliever Phil Coke in the 7th inning. Coke was tagged with the loss. start the 7th inning was the victor. Our Tiger’s have Friday off. and go all the way to the World Series. of key players, such as Miguel Cabrera and Magglio Ordonez. course, keeping the position players off of the dreaded DL is important. Keeping this pitching staff healthy, too, will be important. Unfortunately, as you know, that isn’t an easy thing to accomplish. Injuries happen. There is no way to prevent many of them from happening. healthy enough to return he will take over for Rhymes. great potential as long as he’s healthy (see, there’s that word again). Joel Zumaya in. No worries, Benoit can do the job. also excited to share the 2011 season with you. Comerica Park gates open at 12:30 p.m..
never managed there, during a reunion of the 1984 championship team. Detroit than any other Tiger’s manager (1331). first place finish in the American League East. hope that there will be a renewed call to retire Sparky’s jersey number. The Detroit Tigers have had opportunities to do so, and never have. Sparky will always be a Tiger! games in yesterday’s doubleheader began as classic pitchers duels. Brad Thomas relieved Scherzer in the inning. happened indoors, too, under a dome, at Seattle’s Kingdome. the bad calls continued tonight. The way things have been going for Detroit this almost seemed inevitable, I guess. The blown-calls this season have been like salt in an unseen wound. The real injury came from the arm of Matt Garza. streak to an abrupt end, 4-1. The 400-foot shot off of Gerald Laird’s bat was his third this season, and it put the Tigers ahead early. shut out innings — striking out five and walking only three batters. The Rangers lone run came in the ninth inning when Ian Kinsler scored on a Josh Hamilton ground out. the last week — since the All-Star break — haven’t disappeared. aggressive base running, like we saw when Austin Jackson scored tonight, is something I would like to see more often. The motto should be, “win by playing hard, or lose by playing hard.” Period. and Yankees are waiting just beyond the horizon. Next, the Tigers will host the Toronto Blue Jays. The first game of four is tomorrow afternoon. Justin Verlander is the scheduled starter. third in place of Brandon Inge. 90. Houk manged the Tigers between 1974 – 1978. It was in 1976 that pitching sensation Mark Fidrych became a phenomenon in baseball — Houk was his manager. Here is a link to the Detroit News Online article. CLICK HERE. Ralph Houk from Baseball Reference. CLICK HERE. Ralp Houk Wikipedia. CLICK HERE. Detroit Tigers for the first time in 19 years on Sunday, 7-2.
through the gate, while the ball got away and Peralta rounded the bases. Division nemeses do not play well. are on the road, 16-29.
loss is the fifth in a row for Detroit. too bad that I have heard that come from Jim Leyland far too many times. Why wasn’t this team ready to play? That’s my question. losing to the Indians, they weren’t losing much ground to Chicago. Tigers brought back Rick Porcello to pitch in Saturday’s night-cap. batters. He walked no one.